This is very simple and quite wonderful. I got the recipe from here, and have altered the quantities a little and changed it to UK weight measurements. 1. Place the whole chicken breasts and enchilada sauce in the slow cooker/crock pot and cook on high for 5 hours. 2. Using two forks completely shred the chicken inside the slow cooker. 3. Stir in the tortilla strips, about a third of the cheese and half the olives. 4. 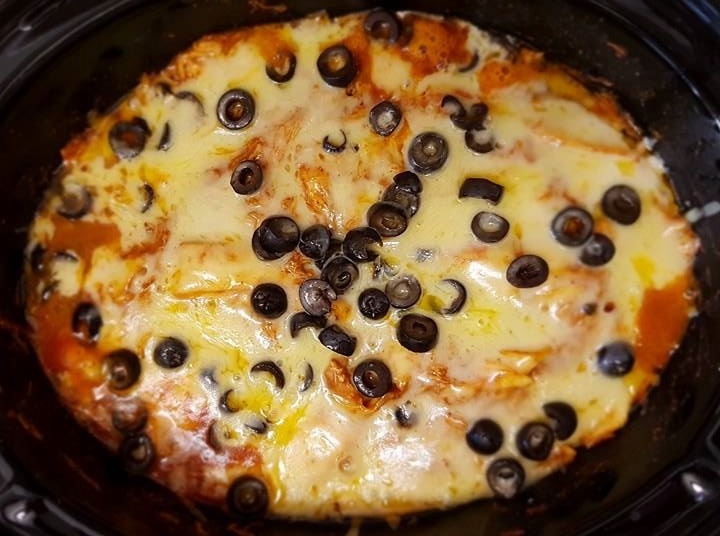 Sprinkle the rest of the cheese and the olives on top, and cook for one more hour. 5. Spoon into bowls, add a large dollop of sour cream, and tuck in. This sounds nice and easy (and tasty!). I’ll bookmark this one. Thanks! I love things that you cook in one pot and eat out of a bowl! Perfect for casual eating, like if you want to sit on the couch and watch TV while you eat 🙂 (Now you’re going to tell me you never do that and make me feel bad aren’t you!). Well that’s somewhat better, although maybe even less likely to appreciate what you’re eating if the book is really good! Yes, this one’s a crowd pleaser! I’m sure it would, although depending on the cut of beef it may take longer to get to the shred-with-forks stage? Pork would be good too. Good point about the cut. We have some kind of roast-y meat in the freezer that is too big to cook for just us. This sounds like a neat recipe to stretch it out across a couple of take-away lunches. Chicken is so much healthier…but sometimes, you just want meat. As I was walking home from grocery shopping this afternoon (with chicken), I remembered this recipe! Going to try later in the week! Love this–I’m a big fan of slow cooker meals, so I’ll be sure to try this one. Thank you! Did you say slow cooker? I don;’t have to cook the chicken just dump it in? Let me kiss your hand. Here’s hoping we have enchilada sauce in this country! I’ve been looking for a quick and easy enchilada recipe for a long time. And voila, here it is. I miss you in the blogosphere. Hope all is well.